These ATEX Certificated IP65/67 M8 and M12 male and female connectors are designed to meet the mechanical and environmental requirements of EC Directive 2014/34/EU-ATEX Annex III/Module B. 2G = equipment suitable for areas where, during normal activities, explosive atmospheres due to gas, vapors or mists (zone 1) may occur; suitable to be installed in zone 1. These ATEX 94/9/CE servo connectors from In2Connect are available as field attachable units with solder or screw contacts. 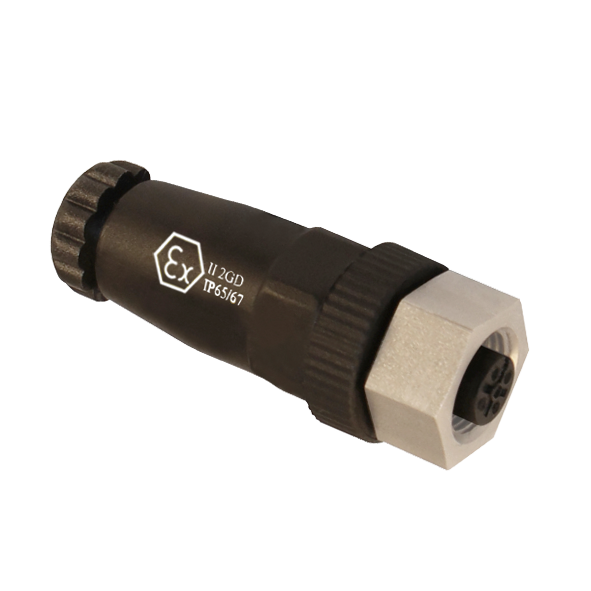 Based on the M8 and M12 threaded coupling connector ranges these field attachable HTP connectors have been designed and manufactured to meet customers’ stringent individual requirements for environmental, electrical and mechanical conditions, whilst conforming to EC Directive 2014/34/EU-ATEX Annex III/Module B (EU-TYPE EXAMINATION # AR16ATEX095X). They are available in axial M8 format with a plastic housing and in M12 as axial or right angled with plastic or metal body shell and are can be used for 2G = equipment suitable for areas where, during normal activities, explosive atmospheres due to gas, vapors or mists (zone 1) may occur; suitable to be installed in zone 1. IIC = not addressed to underground work in mines or their surface plants which could be exposed to risk of explosive atmospheres: used in all other Ex environments. These ATEX Certified M12 connectors from In2Connect are designed to meet IP65/IP67. These connectors have a wide variety of applications and can be found in many Ex industry sectors for use with proximity switches, sensors and interconnection in potentially explosive environmental conditions. 2G Gas type II Subdivision C – Hydrogen and Acetylene. 2G = equipment suitable for areas where, during normal activities, explosive atmospheres due to gas, vapors or mists (zone 1) may occur; suitable to be installed in zone 1.
plants which could be exposed to risk of explosive atmospheres.